AARON MATÉ: It’s The Real News. I’m Aaron Maté. In his farewell address to the nation one year ago, President Obama urged Americans to get involved in politics and run for office. BARACK OBAMA: If you’re disappointed by your elected officials, grab a clipboard, get some signatures and run for office yourself. Show up. Dive in. Stay at it. AARON MATÉ: Well, one year later, many progressives are doing just that. According to a major new report, they are facing strong opposition from the centrist wing of the Democratic Party that Obama represents. In the Intercept, Lee Fang and Ryan Grim report, “In district after district, the National Party is throwing its weight behind candidates who are out of step with the national mood.” The piece is called “The Dead Enders: Candidates who signed up to battle Donald Trump must get past the Democratic Party first.” Lee Fang joins me now, investigative journalist with The Intercept. Lee, welcome. So, you did more than 50 interviews coast to coast. What is your sense of what’s going on with the Democratic Party and the progressive candidates who you spoke to? LEE FANG: Well, as you mentioned, we talked to a lot of folks, talked to political operatives, candidates, Members of Congress. This is a very unique time for the Democratic Party. There are dozens of very serious progressives who are running for Congress, taking that call from Obama very seriously and putting together a campaign staff, raising money, putting forth well thought out policy positions that are very bold and progressive. And these are first time candidates and they’re finding in race after race, that the Democratic Party establishment is doing everything they can to sideline more left of center candidates in favor of party chosen, more centrist, business friendly political candidates who can simply raise the most money and who have shown a history of being favorable to business interests. This is something that has gone on for a very long time but the Democratic Party establishment, the DCCC, the arm of the Democratic Party dedicated to electing Members of Congress to the House of Representatives has really taken this very long standing tradition and gone into overdrive the campaign cycle, working with other affiliate Democrat groups to kind of handpick centrist and conservative Democrats in competitive races across the country. AARON MATÉ: And one litmus test that you point out in your piece that the party is using in terms of how to choose candidates is something called “the phone test.” Can you talk about that? LEE FANG: That’s right. We’ve heard from candidates that the D-trip will go out and rather than asking a candidate where they stand on the issues, what are the most important societal or economic concerns in their district, they do a phone test, which is they’re asking candidates to take out their phone, go through their Rolodex or their list of contacts and show them that they can raise 100,000, 200,000, up to 250,000 dollars just from the contacts in their phone. So, they’re going to folks who are deep in the business community, folks who have maybe served in the state legislature, who have an experience raising this type of cash or folks who were candidates for office in 2016 who have established donor networks. That’s the main litmus test that we’ve heard over and over again for candidates. And you know, for some folks, if you look at the first or second quarter of fundraising, they can raise a lot of money because they have a lot of wealthy contributors who can max out in their campaign, giving big checks of 1,000 dollars or 2,700 dollars. But for first time candidates, a lot of those folks are relying on small contributions, contributions of 50 dollars or 100 dollars and it’s hard to demonstrate to party officials, that they can raise big cash early in the campaign. But the flip side of this whole kind of strategy from the DCCC is that the big donors max out early on and you can’t tap them later in the campaign but the small donors are in some ways a more efficient way to run a campaign because small donors will also volunteer. They can continually give throughout the campaign and there’s a higher level of engagement. So, even that Rolodex test is a kind of a weak litmus test. AARON MATÉ: Now, one interesting phenomenon that you point out is that the DCCC and other prominent centrist groups are throwing their weight behind candidates who have most recently lost. For example, Angie Craig in Minneapolis. LEE FANG: Yeah, that’s right. LEE FANG: That’s right. Angie Craig ran for office, got the Democratic Party kind of establishment machinery support in a district just kind of south of St. Paul. It’s a suburban seat. She raise a lot of money. I believe spent almost $3.8 million but came up short. Basically got the same number votes as a previous Democrat that spent a fraction of that money. Other similar cases, Chrissy Houlahan in northeast Pennsylvania was the kind of party establishment candidate. She ran a very centrist campaign, not mentioning many policy issues, doing most of her campaign outreaching to Republicans, hoping to peel off suburban and kind of independent voters who had traditionally voted Republican. Didn’t kind of embrace any big picture populist issues like Medicare For All or a carbon tax, opposition to free trade deals. And again, this is another example of a candidate who lost, who underperformed Clinton in this district. Raised a lot of money but underperformed the top of the ballot. So, maybe, in one sense, you would assume that the party would say, “Okay, this is a candidate that can’t do well. Maybe this independent, centrist model doesn’t resonate with voters,” but instead the Democratic establishment is doing everything they can to promote those same candidates from two years ago that underperformed the ticket, maybe they can raise the most money or perhaps because of their centrist policy positions. And they’re sidelining populist progressives who are kind of doing the very opposite. They’re embracing big, bold ideas. They’re working with grassroots groups. They’re building a huge campaign operation of volunteers and they say then for these kind of more grassroots candidates, Jeff Erdmann in Minnesota, in the same district, and Jess King in northeast Pennsylvania, they say they’ve been completely shut out. 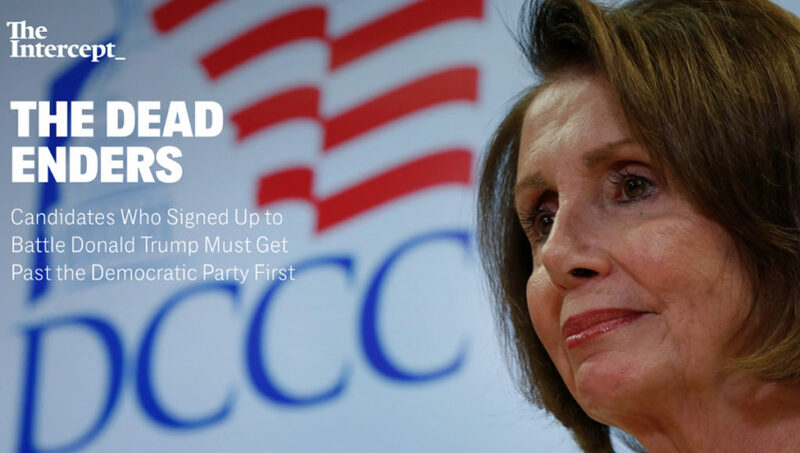 That the DCCC, other kind of affiliate Democratic groups that are close to the party have endorsed the centrists. They’re funneling large amounts of money. They’re bringing members of Congress who are Democrats into the district to endorse the centrist candidate. You know, for a lot of these races, these endorsements and the money makes a big difference. It’s hard for people who are already focusing on the Trump administration and are focusing on the other big fights in politics, to kind of follow every single one of these smaller primary campaigns. AARON MATÉ: Based on your reporting for this piece and your overall reporting on the role of money in politics, to what extent can we attribute all this to sort of a consultancy industrial complex? The need for candidates to raise money for the purpose of being able to pay for these high-priced consultants that dominate the party? LEE FANG: Look, a lot of my reporting is on the role of special interests influencing the policy process, influencing regulators, lawmakers, kind of shifting the priorities of public officials to favor special interests that kind of game the process. But another aspect of this is simply the kind of nuts and bolts of campaigning. As the price of elections go higher and higher, there’s more kind of an incentive for consultants to gain the process and win these kind of lucrative contracts to manage these campaigns. Some of these Congressional campaigns, they cost maybe a couple hundred thousand dollars a decade or two ago, now cost 10 million dollars, 15 million dollars. Even higher than that. For campaign consultants, particularly folks who work in advertising, television, digital advertising and in fundraising, they receive a percentage of the amount spent. If you’re a TV consultant, you can make between 5 and 15% of each TV buy, of other advertising buys. There’s a strong incentive for Democratic consultants to steer the party to support the candidate that they think will not only raise and spend the most money, but will go with their consulting firm. This is a dynamic that’s existed for a very long time but for the candidates that we’ve spoken to, both on the record for the story and off the record, there’s a lot of kind of quiet complaints about this. They see the party steering money and resources to candidates that are hiring consulting firms that are connected to the party. This is kind of a level of corruption that doesn’t raise to the same level of oil companies buying legislation but it does make a big difference in campaigns if these consultants perhaps don’t perform the best or if they’re changing the makeup of the next wave of the Democratic Party. I mean, we could have a completely new Democratic Party after the midterm elections, if there is truly a wave. We have dozens or perhaps hundreds of new Democrats in office but they’ve been chosen by a certain select class of campaign consultants. That makes a big difference in terms of politics and policy for the foreseeable future. AARON MATÉ: Right. I mean, you point out that part the reason why Obama may not have been more progressive when he was in office was that he was surrounded in Congress by a large number of centrist Democrats. Speaking of centrist Democrats, I want to play a clip of Chuck Schumer. This is him in early 2016 outlining the Democratic strategy of basically seeking suburban voters who voted for Mitt Romney, not working-class voters, who Schumer said that the party can afford to lose. CHUCK SCHUMER: For every blue-collar Democrat we will lose in western PA, we will pick up two, three moderate Republicans in the suburbs of Philadelphia. You can repeat that in Ohio and Illinois and Wisconsin. AARON MATÉ: That’s Chuck Schumer speaking way before the 2016 general election and we know how that turned out. The Democrats lost Ohio. They lost Wisconsin. They lost Pennsylvania and they lost the election. Lee Fang, final thoughts as we wrap? LEE FANG: Well, this has been the conventional wisdom of Democrats. You know, it was definitely the guiding strategy in 2016 but this has been the conventional wisdom for over 10 years now. In the piece, we show how previous wave elections like in 2006 simply didn’t work. A lot of the centrist, conservative Democrats that based their campaign around reaching out to Republicans or co-opting Republican ideas actually lost and the more progressive candidates were shut out by the party. People like…Porter, John Hall, Gary McInerney, who didn’t receive any significant support from the DCCC or from the Democratic consultant class, they ended up winning. So, even though we’ve got this long history of evidence of what works and what doesn’t work. The Democratic Party is simply kind of going back to what doesn’t work. AARON MATÉ: The piece is called, “The Dead Enders: Candidates who signed up to battle Donald Trump must get past the Democratic Party first.” Lee Fang of The Intercept, thank you. LEE FANG: Thanks for having me.